The Department for Energy and Climate Change is currently undertaking a consultation on the Habitats Regulations Assessment (HRA). The HRA is a legal requirement to ensure that protected habitats will not be impacted by adverse effects on their integrity by shale gas operations, including fracking. In Somerset this mainly means impacts on the protected areas between Clevedon and Minehead and parts of the Somerset Levels. These protected areas are wetlands and are protected by the international convention, UK and EU law – the Ramsar Convention, Habitats Conservation Regulations 2010 and the European Habitats and Birds Directives. The areas are protected because they are internationally recognised as important sites for biodiversity. Recent changes to the law mean that fracking can take place underneath all of these areas but the HRA accepts that fracking operations would have a negative impact if they were to take place on the surface inside the protected areas. This is stating the obvious as these are strictly protected areas. After hundreds of pages of inpenetrable maps and analysis the HRA concludes that surface operations could take place anywhere outside of the protected areas without adverse impacts, subject to a few non-biding licence advice notices. The HRA provides no option not to issue a licence no matter what the environmental conditions. The government has been advised by their former Chief Scientific Advisor that exploitation of shale gas would lead to additional cumulative greenhouse gas emissions and further global warming unless displaced fuel is not burned. The government can’t stop Qatar selling their gas to others if we don’t buy it. Global warming causes sea level rise and sea level rise is expected to remove three quarters of the intertidal habitat in the Severn Estuary over the next 60 years. Exploiting shale gas will therefore have a very plausible detrimental impact on these protected coastal habitats which the government has a legal obligation to protect. The HRA doesn’t even mention climate change or sea level rise, despite DECC being concerned about sea level rise and flooding in relation to Hinkley Point power station – which is slap bang in the middle of the Somerset assessment area. The HRA also relegates surface contamination from leaks & spillage and potential well failure to a stage of fracking operations that they say is not relevant to the assessment. It clearly is. The assessment closes at 11:45 am on the 29th September. You can respond to the assessment and make your voice heard. The HRA documents are voluminous and difficult to understand. You can see Frack Free Chew Valley’s response in summary and in detail by following these links. NB The government is filtering the best scientific advice from its Advisors and Parliamentary Environmental Audit Committee through the prism of a self appointed industry funded ‘task force’ and is cherry picking evidence to justify pressing ahead with shale gas no matter what. The issues of climate change and sea level rise are just massive to the future of Somerset and its effects are already being felt. The HRA ignores this and the well known critical drainage situation both on the coast and inland. The government has announced the preliminary results of the 14th Onshore Licensing Round for oil and gas licenses. There are two categories i) 27 blocks that will be offered licences without further assessment and ii) a further 132 blocks that first need to undergo Appropriate Assessment and consultation. A block is an Ordnance Survey 10 x 10 km grid square. In Somerset all of the 10km blocks are in the ‘ST’ 100km block. The licenses don’t extend into the sea but they do extend onto the large foreshore areas, some of which are protected. The ‘Appropriate Assessment’ refers to an assessment of the licence blocks in relation to the Conservation of Habitats and Species Regulations 2010. 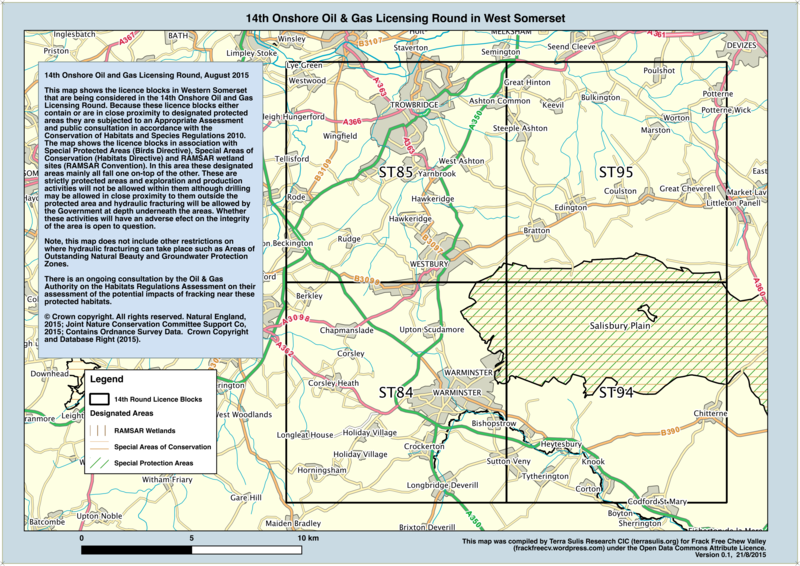 In Somerset the previous licences in the Bristol-Somerset coalfield have not been renewed, so those areas including the Chew Valley are not at risk of unconventional gas exploration and development in this licensing round. It is a good thing too because the Department of Energy and Climate Change has confirmed to us that the ‘safeguards’ in the Infrastructure Act (such as not fracking in Areas of Outstanding Natural Beauty and not fracking at shallow depths) do not apply to coalbed methane. Eleven of the licence blocks in the Appropriate Assessment category are either within Somerset or adjacent to Somerset and include 400 km2 to the east of Frome and a large area along the cost from Clevedon to Dunster. These licence blocks must go to consultation because they either contain or are in close proximity to designated protected areas protected by law and international treaty. DECC’s consultants have advised that with respect to the Habitats Regulations ALL of these blocks (with some caveats) can be licensed and that gas development will not have ‘Adverse Effects on Integrity’. This basically means that drilling for gas can be conducted up to the boundary of the designated areas and beneath the designated areas. The Government has a track record in ignoring the results of consultations. 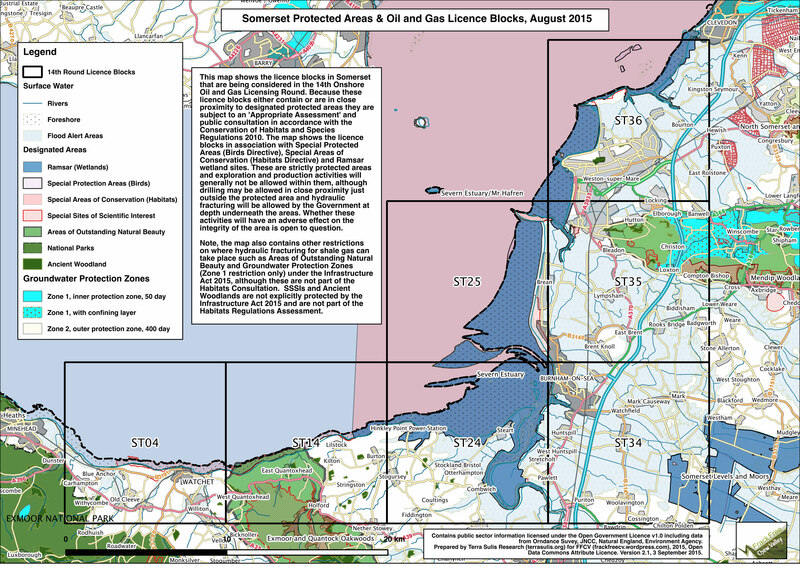 This is the area and licence blocks in West Somerset with the Special Areas of Conservation, Special Protection Areas and RAMSAR wetland sites indicated. Click to download. You can respond to the Government Consultation on the Habitats Regulations Assessment via the DECC web site – or here is the document you need to refer to: Consultation_OGA_branded_summary_document. Here is a reduced size collated version of DECC’s Appendix D and maps – Block_ST_14th_Round_reduced_size. NB These maps only contain information regarding the Habitats Regulations which are directly relevant to the consultation. That is not the whole story however and other maps will follow with AONBs, National Parks, and SSSI”s (now removed from the ‘safeguards’) etc. This web page contains map information that is copyright 2015 Ordnance Survey and the Joint Nature Conservation Committee under the Open Government Licence. See JNCC for information on the designated sites protection status. Do legal safeguards relating to fracking for Shale Gas apply to Coalbed Methane in Somerset? The Infrastructure Act 2015 contains a list of twelve onshore hydraulic fracturing safeguards. The list of safeguards is quite long (see below) and includes a condition that “prohibits associated hydraulic fracturing from taking place in land at a depth of less than 1000 metres”, a condition prohibiting “associated hydraulic fracturing” from taking place in groundwater protection source areas and other protected areas such as Areas of Outstanding Natural Beauty and a condition ensuring that methane in ground water will be monitored for 12 months prior to commencing “associated hydraulic fracturing”. The Department for Energy and Climate Change (DECC) has confirmed to FFCV that the definition of “associated hydraulic fracturing” in the Petroleum Act 1998 and the Infrastructure Act 2015 DOES NOT APPLY to Coalbed Methane (CBM). It follows therefore than none of the legal safeguards in the Act apply to CBM either. The government’s definition of associated hydraulic fracturing “means hydraulic fracturing of shale or strata encased in shale” and does not include coal where coalbed methane is found. On this issue DECC have said “To confirm, this definition does not apply to CBM“. CBM is the primary unconventional gas of interest in the Bristol-Somerset coalfield. This is an obtuse way of saying that fracking will not occur in the top 5000 feet depth from the surface (although this is not actually correct as the Act says 1000m which is 3280 feet). According to DECC this does not apply to CBM in Somerset. The Government’s Planning Portal states that CBM extraction “is likely to be achievable between 200 and 1500 metres”. There would appear to be no legal safeguard prohibiting fracturing of coal for CBM at depths as shallow as 200m either outside or inside the Mendip Area of Outstanding Natural Beauty. According to DECC this does not apply to CBM in Somerset. This is because the protection is contingent on the definition of associated hydraulic fracturing not the definition of protected areas such as AONBs. According to DECC the condition to monitor methane in groundwater for 12 months before fracturing does not apply to CBM in Somerset. This is because the protection is contingent on the definition of associated hydraulic fracturing which doesn’t apply to CBM. According to DECC this won’t apply to CBM as the Act only applies to shale gas. Any payment would therefore be voluntary under the industry’s code. In relation to coalbed methane in Somerset Mr Rees-Mogg does not appear to know what law and safeguards apply or do not apply, so how can he assess the risks of coalbed methane production in his constituency? According to the Somerset Guardian Mr Rees-Mogg has urged local residents to ignore ‘scare stories and scaremongering‘ around fracking and has ‘dismissed the concerns voiced by opponents‘. He has also said that “lack of information about the locations, size and scale of exploration works was in part to blame for the anxiety” whereas the location, size and scale of exploration work is well known because the American Coalbed Methane industry has described it in some detail – see the GeoMet report – and is the cause of much anxiety! Information on the Infrastructure and Petroleum Acts can be found here. Information on the potential “location, size and scale” of exploration and development can be found here (based on information from DECC). 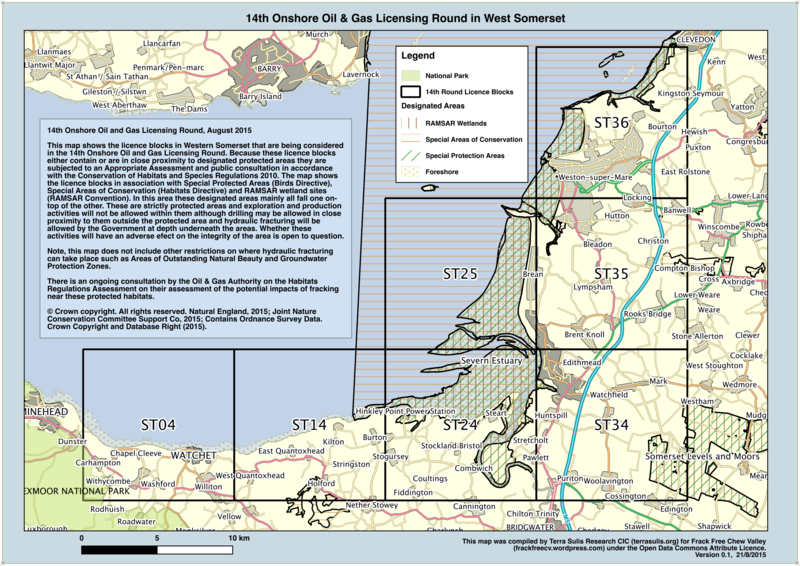 The first results of the 14th Round of Onshore Licensing for unconventional gas may be announced any time during August 2015 – see recent post. Beware permitting fracking, says farmer who allowed coal methane borehole. In vast swaths of rural New South Wales, there’s only one election issue: coal seam gas [aka coalbed methane]. Fracking safeguards that don’t apply to Coalbed Methane in the Bristol-Somerset coalfield? (b) that a scheme is in place to provide financial or other benefit for the local area. What is “associated hydraulic fracturing”? (ii) more than 10,000 cubic metres of fluid in total. NB DECC have confirmed that this definition DOES NOT APPLY to Coalbed Methane. Ashely Fox MEP (Conservative) conducts his own online polls including the questions Should Britain be accessing it’s shale gas reserves? and Is onshore wind power worth investing in as part of a diversified energy sector? He then publishes an annual summary of the survey results including the percentage of respondents who answered in different ways and matches the results with his own views. However, he provides no information on what measures were taken to ensure that the surveys are representative or how many respondents answered each question. The result for Mr Fox’s shale gas question was 92.9% in favour and 7.1% against. The result for Mr Fox’s wind power question was 73.7% against (not worth investing in) and 26% in favour and 0.3% Don’t Know. Are these poll results indicative of public opinion nationally or in the South West or are they just self-selecting and self-serving nonsense? In stark contrast to Mr Fox’s poll results a national poll by YouGov for the Sunday Times shows that in May 2015 43% (Fox 7%) of respondents were against the development of shale gas and 32% in favour. Similarly the same YouGov poll shows that the public still supports onshore wind development with 61% (Fox 26%) of respondents supporting the industry. Dr Julia Reid MEP (UKIP) doesn’t have her own polls but rather favours sound-bite videos of her speeches in the European Parliament to communicate her views. Dr Reid doesn’t let her scientific qualifications get in the way of UKIP’s climate science denial based energy policy. In this one minute video she says “Since 1995 global warming has not been happening” ignoring the fact that it is a well established scientific fact that global warming has not stopped and that more than 90% of warming is in the oceans not the land surface air temperature. Here is a more authoritative 1 minute video on global warming from the Royal Society. 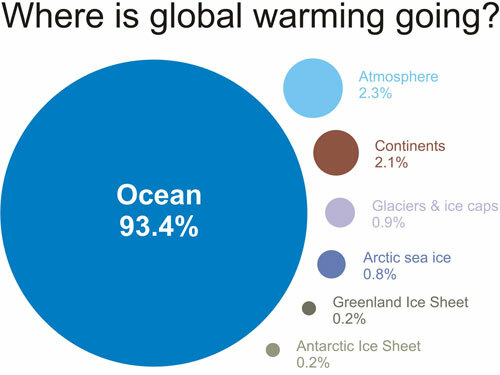 Climate Myth – What has global warming done since 1998? Strangely Dr Reid seems to accept what the UN has to say about ozone depletion and the need for global action but rejects what the UN, the world’s Science Academies and NASA have to say about human made global warming. Election Time – what are the candidates saying? What do the parties and the North East Somerset candidates think about fracking? Labour says: “Will establish ‘robust’ regulations ‘before’ fracking can take place. UKIPs say: “Its ‘time to get fracking’, ‘provided safeguards are in place to protect.. the environment’. NB UKIP is the only party that embraces climate change denial, as outlined in their energy policy document. Jacob Rees-Mogg (Conservative) – having been a vocal pro-fracker during the parliament Mr Rees-Mogg has said that he is now a NIMBY and that North East Somerset isn’t a suitable area. However, he maintains that fracking can provide energy security and cheap energy, although he still hasn’t provided any evidence for this last statement. Todd Foreman (Labour) – Mr Foreman has been rather consistent in opposing fracking in North East Somerset, saying in the Somerset Guardian that he would oppose “any plans that would allow fracking here”, although he hasn’t ruled it out elsewhere. Wera Hobhouse (Liberal Democrats) – Ms Hobhouse points out that there is no financial case that fracking will provide cheap energy in the UK and that she is opposed to fracking in North East Somerset. Ernie Blaber (UKIPs) – Mr Blaber opposes fracking in North East Somerset – unless the gas companies offer loads of money and there is a local referendum that supports it. Katy Boyce (Green) – Ms Boyce said in the Somerset Guardian that she opposes fracking in North East Somerset, no surprise there. So, the local Conservative, Lib Dem, Labour and UKIP candidate are all NIMBYs when it comes to their party manifesto statements. We are all NIMBYs now it seems. Despite what they have publicly said Mr Blaber and Mr Rees-Mogg haven’t signed the Friends of the Earth I’M NOT BACKING FRACKING frack-free promise, the other candidates have signed. If you feel so inclined then you can ask Mr Blaber and Mr Rees-Mogg to sign up here. Update: The government accepted changes to the Bill tabled by Labour including independent well inspection, monitoring of methane leaks and informing residents of local fracking and removing the clause allowing any substance to be left in the ground. Labour however abstained on the amendment for a fracking moratorium. Whilst the government also committed to cancelling licences if advised by the Committee on Climate Change that shale gas would not enable the UK to meet its climate change commitments, this does not robustly address the climate issue highlighted by the Environmental Audit Committee. Labour abstained from voting on the proposal for a moratorium. Update: In a shambolic debate on the Infrastructure Bill today in the House of Commons MPs complained that they did not have time to debate the issues, that they didn’t know what they were voting on (as the government hadn’t tabled its amended amendment to one clause), that what was happening was undemocratic, MPs voted through changes to the trespass law (amongst other things). Other amendments were also rejected but as yet it is unclear what has really transpired. The government has conceded that fracking will be banned in National Parks, AONBs and SSSIs but the status of ancient wood land remains unclear. Other amendments and concessions were made but it may take a few days to really understand what has happened. The bill will now return to the House of Lords. Update: David Cameron said today “We want to have greater energy security, we want to keep prices down, we also want to tackle climate change.” Apart from George Osborne and the drilling companies it is hard to find anybody who agrees with this statement. This evidence based cross-party Parliamentary report cuts through the spin and nonsense (cheap gas, transition fuel, etc) that has been used by the government to promote the fracking industry. Hopefully it will inform the debate in Parliament on the infrastructure bill later today! “A moratorium on the extraction of unconventional gas through fracking is needed to avoid the UK’s carbon budgets being breached.” The Committee recognises that unconventional gas is likely to add to our greenhouse gas emissions rather than reduce them, meaning that we can’t stick to our legally binding climate change commitments. This can be done by amending the Infrastructure Bill – being debated today! “Fracking must be prohibited outright in protected and nationally important areas including National Parks, the Broads, Areas of Outstanding Natural Beauty, Sites of Special Scientific Interest and ancient woodland, and any land functionally linked to these areas.” Enough said. The time required to develop an unconventional gas industry (10-15 years) means that unconventional gas would be competing not with unabated coal (which will largely have been phased out) but with renewables – making a nonsense of the transition-fuel argument for unconventional gas. Regulation of unconventional gas is not fully coordinated across government. Environmental baselines should be in place and should inform licensing. Fracking in Lancashire – a threat to us all. At the end of January, Lancashire Council will make a decision on whether to approve two fracking applications that have been made by Cuadrilla for exploration within PEDL 165. This has serious consequences not only for Lancashire but for the rest of the UK, as approval there could set a precedent for the rest of the country. ‘Frack Off’ says that ‘If approved these applications would permit the first use of high volume hydraulic fracturing for shale gas in the UK since Cuadrilla’s first frack at Preese Hall in Lancashire in 2011 (i). Remember the earthquakes? On 16th January the Environment Agency granted environmental permits after what it describes as a ‘rigorous assessment’ of Cuadrilla’s applications (ii). These permits will apparently ensure the safety of people, ground water and the environment from the effects of mining waste, gas flaring, radioactive material and chemical pollutants that will arise as part of the fracking process. At a time when the Government is offering assurances that fracking is a safe process, with appropriate regulations and monitoring in place, Defra plans to ‘reduce regulatory and administrative burdens’ by reducing air quality monitoring and perhaps more interestingly, proposing to abolish air quality objectives for four pollutants, two of which are of concern in fracking (iv). None of this makes sense.